Hello, my name is Emma and in today's lesson, we are going to learn about weather expressions. Okay, weather expressions. 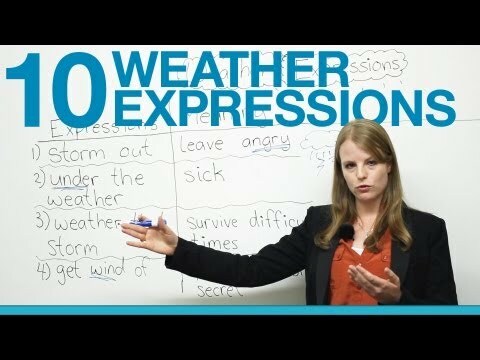 So I will teach you 10 new expressions that have to do with wind, rain, storm, thunder, and weather. Okay? So let's get started. The first expression I want to teach you today is: "storm out". So, what is a storm? A storm is when you have heavy rain, lots of lightning, lots of loud "boom" thunder sounds. So that's a storm. So we use it when we talk about weather, but we also can use it when we talk about how people leave. Okay. So when someone leaves a room very angrily, - okay -, they storm out. I don't know if you've ever seen someone storm out, but if maybe you have two friends and they have a fight, when there's a fight, usually one person storms out; they leave the room quickly and angrily. So the key word here: "angry". Our second expression: "under the weather". Okay. And it's important to note which preposition we're using; not: "over the weather". "Under the weather". What does this mean? It actually doesn't have to do with weather. It means you're sick if you are under the weather. It's a common expression; we use it a lot. -"How are you feeling today?" -"Oh, I'm a little under the weather. ", "My teacher didn't come to school today; she was feeling a little under the weather." So we can use: "I'm under the weather." Or: "I'm feeling under the weather." Both are okay. Third expression for today: "weather that storm". So again, I showed you what a storm is, lots of rain, thunder, lightning. What does it mean to "weather a storm" or "that storm"? Well, when you weather a storm, it means you have a difficult situation and you get through it. So, for example: maybe you have to do a big English test, maybe you're doing the IELTS or the TOEFL or just a general English test, and you and your classmates are very good friends. And every night you study, you work very hard; you study, study, study and finally the test day comes, and you pass the test. You weathered that storm. So any difficult situation or problem that you get through. Okay. I like this expression a lot. Let me think of another example. Surviving difficult times. If you have a boyfriend or a girlfriend, and maybe you break up, and you're very, very sad but one day you feel happy again - you weathered that storm. Our next expression: "to get wind of something". So what is "wind"? This is our key weather word. "Whish, whish." Wind. If you get wind of something, it's like the wind blows you information. So to get wind of something means you find out information or a secret. So maybe it's somebody's birthday party, maybe you're throwing a big surprise party for your friend. You don't want them to get wind of the party; you want to keep it a secret, you don't want them to know. Maybe someone says something about buying a cake, and they start to think: "Oh, there's going to be a party for me." They get... They got wind of the party. So usually: "Get wind of something." Something. Maybe if you celebrate a holiday, maybe if you celebrate Christmas or Chinese New Year, some sort of holiday and someone bought you a very nice present, maybe you get wind of what is... What the present is. Maybe it's a trip. So if you get wind of something, it means you learn some new information, and usually it's secret information that you've now discovered. So number five on this list: "rain on my parade". You can rain on somebody's parade, not just "my parade". So you can say: "rain on his parade", "rain on Mary's parade", "rain on Abdullah's parade". Okay? So you can change this to "his", "her", "my", "your" or a name. What does it mean to rain on someone's parade? If I rain on someone's parade it means I lessen their happiness. Okay? So this is not a good thing; to rain on somebody's parade is a bad thing. It means somebody's very, very happy about something and you say something that takes a little bit of that happiness away. So what are some examples? Well, maybe I got a new promotion at work. I'm very happy. I have a new job at work, it's a great job, I'm telling my friend about it and they say: "Well, it's great you have a new job, but you're going to be very, very busy now and maybe you'll have a lot more stress." So my friend has now lessened my happiness; I'm less happy now when I think about stress, and pressure, and hard work maybe. What's another example of raining on someone's parade?